Highly portable compact chemical toilet from Dometic. Comfortable adult size seat and lid provides both comfort and safety. Scratch resistant finish is easy to keep clean and looks new for years. Extra strong 360° manual flush ensures effective cleaning. One piece waste tank with integrated spout wont leak. Quality double sealed valves stops leaks and odours. Can be used up to 50 times before waste tank requires emptying. 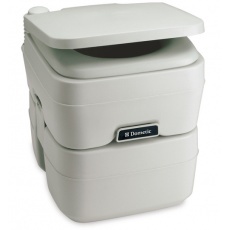 Up to 29 flushes per water fill with 9.8 litre fresh water tank. 19 litre waste tank capacity.